The Sarnia Braves Bantams are, from left, front row: Logan Woods, Keegan Riedel, Masen Flett, Mason Minielly, Quinton Johnston, Zion Ainsworth and Tyler Winship; middle row: Brady Pepper, Yanic Babcock, Kaleb Nelson, Ryan Steeves, Nicholas Cotton and Logan Buntrock; back tow: Coach Joel Ainsworth, Coach Brent Steeves, Matthew Regnier, Dylen Pepper, Drayden Pepper, Coach Aaron Buntrock and Coach John Woods. Missing: Coach Brian Riedel. 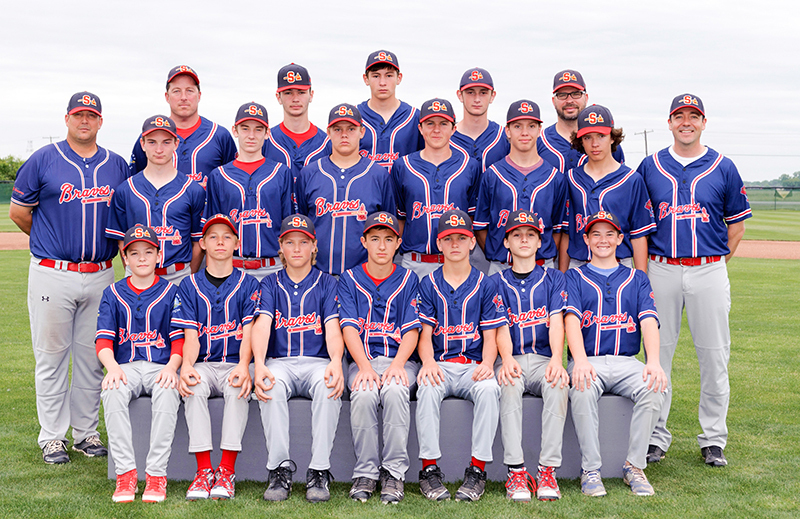 After dropping just two games all season and owning the best record in the London and District Baseball Association, the Sarnia Braves bantam baseball team won the league playoffs on Aug. 19. The Braves lost their opening game to St. Thomas, but won two straight to meet again in the semifinals. Yanic Babcock’s complete game shutout sent the Braves to the finals. Tyler Winship pitched into the sixth inning with a strong championship game outing. Ryan Steeves and Dylen Pepper closed out the game as the Braves captured the league title with a 5-2 win over North London.